Rock support is the term widely used to describe the procedures and materials used to improve the stability and maintain the load bearing capacity of rock near to the boundaries of an underground excavation. 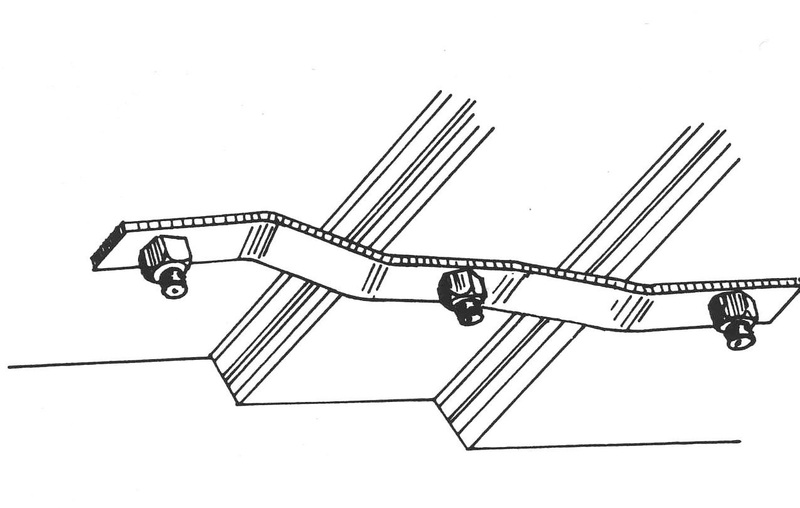 In this paper, a distinction is drawn between rock reinforcement or active support, where the supporting elements are an integral part of the reinforced rock mass, and rock support or passive support, where the supporting members are external to the rock and respond to inward movement of the rock surrounding the excavation. 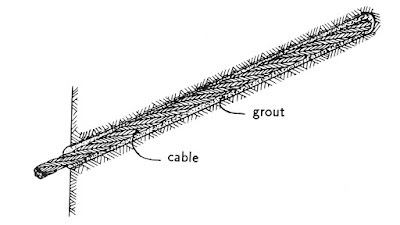 A good example of active reinforcement is a pattern of untensioned grouted dowels which are tensioned as the rock deforms and which interact with the rock in much the same way as reinforcing steel does with concrete. Steel sets are an example of passive support since they external to the rock mass and can only respond to progressive inward movement of the loosened rock mass. The primary objective of a support system is to mobilize and conserve the inherent strength of the rock mass so that it becomes self-supporting. Rock support generally combines the effects of reinforcement, by such elements as dowels, tensioned rock bolts and cables, and support, with shotcrete, mesh and steel sets which carry loads from individual rock blocks isolated by structural discontinuities or zones of loosened rock. These notes are intended to assist the underground support engineer in choosing the most appropriate, and the easiest to install, combination of reinforcement and support. If possible, the installation of rock support should be carried out as an integral part of the excavation cycle to enhance the self -supporting aspects of rock mass improvement. NOTE: The choice of the type of support installed in a particular underground excavation depends upon the extent of the zone of loosened or fractured rock surrounding that excavation. Illustrations of different support systems are presented on the pages which follow. These illustrations are intended to provide a condensed summary of the most important features of each system and to act as simple design aids to rock support designers and users. Figure illustrates a number of components which can be used in different combinations. 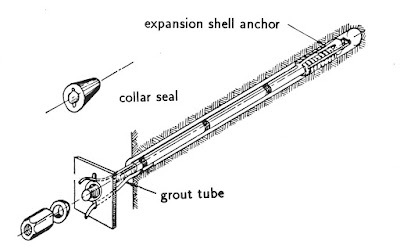 The expansion shell anchor is one of a large number of different types, all of which operate in basically the same way. 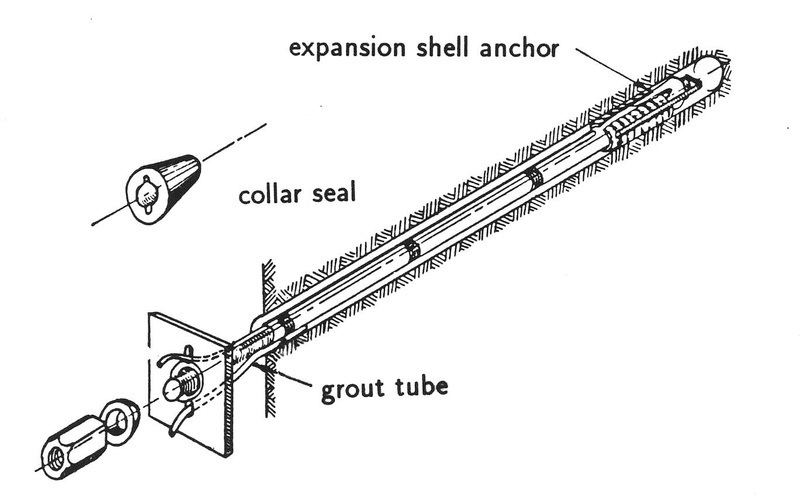 A wedge, attached to the bolt shank is pulled into a conical anchor shell forcing it to expand against the drillhole walls. When grouting a bolt, the rubber grout seal is used to centre the bolt in the hole and to seal the collar of the hole against grout leakage. An alternative system is to use a quick setting plaster to seal the hole collar. The grout is injected into the collar end of the hole (except in down-holes) and the return pipe is extended for the length of the hole. 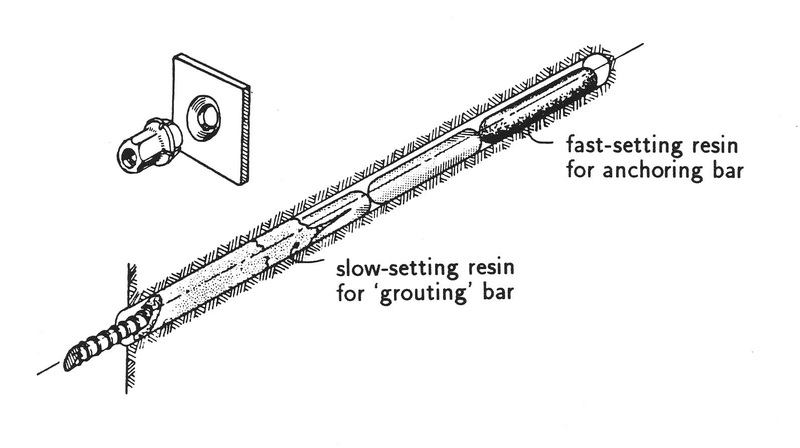 Grout injection is stopped when the air has been displaced and grout flows from the return tube. Bolt can be tensioned immediately after installation using an impact wrench, torque wrench or hydraulic jack, and grouted at a later stage when short term movements have ceased. This system provides very reliable anchorage in good rock and high bolt loads can be achieved. Correct installation requires skilled workmen and close supervision. Grout tubes are often damaged during installation. These bolts are very widely used for permanent support applications in civil engineering. Mechanically anchored bolts without grout are widely used in mining. Developed as an inexpensive solution where use of untensioned dowels is appropriate. A thick grout is pumped into the drillhole by means of a simple hand pump or a monopump. 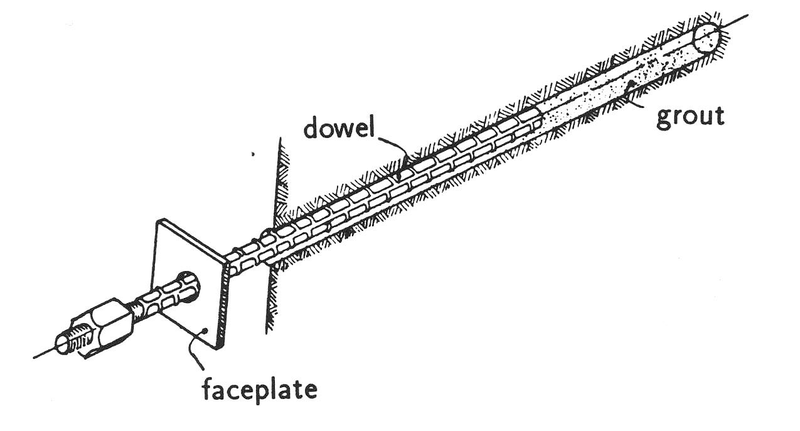 The dowel is pushed into the grout as shown in Figure. 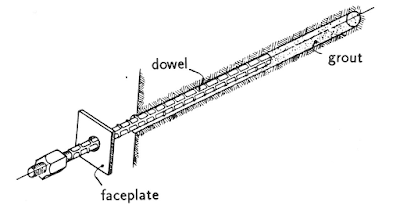 For up-holes, the dowel is sometimes held in place by bending the dowel slightly during insertion. 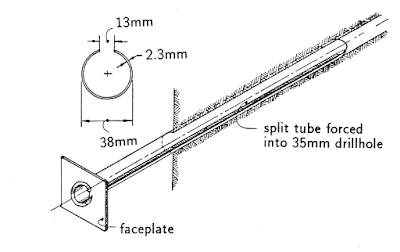 A faceplate and nut can be added if required although, for light support, a plain dowel is sometimes used. Resin cartridges can also be used to encapsulate the bar and provide bonding to the rock. Simple and inexpensive. High corrosion resistance in permanent installations. Cannot be tensioned and hence must be installed before significant deformation of the rock mass has taken place. Care must be taken to ensure resin ‘grout’ is mixed. Resin has limited shelf life. Widely used in the mining industry for general support duties. Developed by Atlas Copco AB, the Swellex deformed tube is expanded by water pressure to the the shape of the drill hole. Mechanical interlock of the bolt and the rock then prevents the bolt from sliding. 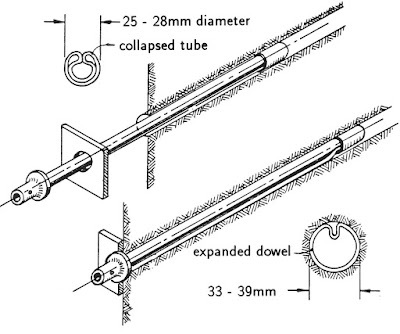 Expansion of the deformed tube leads to some reduction in length, which puts the Swellex into tension. Rapid and simple installation. Gives immediate support action after installation. Can be used in a variety of ground conditions. 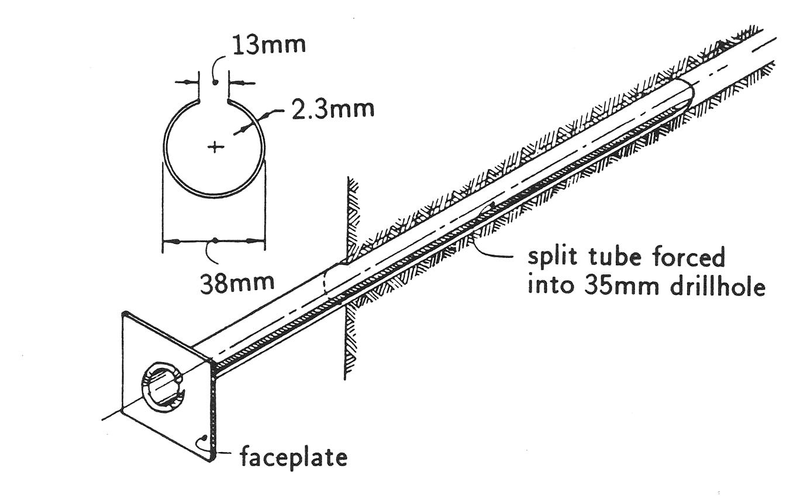 The installation causes contraction in the bolt length. This effectively tensions the face plate against the rock surface. Swellex bolts are commonly used in the mining industry for medium-term support requirements. Becoming increasingly used in civil engineering tunneling work. Developed by Scott in conjunction with the Ingersoll -Rand Company in the U.S.A., this device has gained considerable popularity in the mining industry. As the split tube is forced into a drillhole, the spring action of the compressed tube applies a radial force against the rock and generates a frictional resistance to sliding of the rock on the steel. This frictional resistance increases as the outer surface of the tube rusts. Simple and quick to install and claimed to be cheaper than a grouted dowel of similar capacity. Useful in moving and bursting ground. Cannot be tensioned and hence is activated by movement in the rock in the same way as a grouted dowel. Its support action is similar to that of an untensioned dowel and hence it must be installed very close to the face. The drillhole diameter is critical and most failures during installation occur because the hole is either too small or too large. In some applications, rusting has occurred very rapidly and has proved to be a problem where long term support is required. The device cannot be grouted. Used for relatively light support duties in the mining industry, particularly where short term support is required. Little application in civil engineering at present. The most sophisticated rockbolt system currently in use, combines most of the advantages of other bolt systems. Resin and a catalyst are contained in plastic ‘sausages’, the catalyst being separated in a glass or plastic container in the resin. These capsules are pushed into the hole with a loading stick and the bar is then inserted. 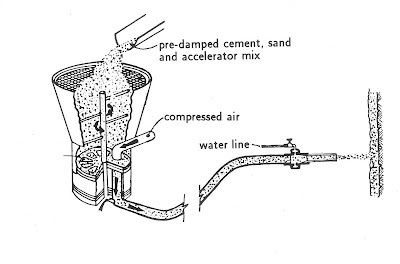 Rotation of the bar during insertion breaks the plastic containers and mixes the resin and catalyst. The bar illustrated in Figure has a very coarse rolled thread which gives good bonding and allows the length of the installation to be adjusted very easily. This system is very convenient and simple to use. Very high strength anchors can be formed in rock of poor quality and, by choosing appropriate setting times, a ‘one shot’ installation produces a fully grouted tensioned rockbolt system. Effective resin mixing requires careful adherence to recommendations provided by manufacturers. Resins are expensive and many have a limited shelf-life, particularly in hot climates. Increasingly used in critical applications in which cost is less important than speed and reliability. Grouted cables were introduced to mining for reinforcement of the backs of cut and fill stopes. Cable reinforcement, using tensioned or untensioned, fully grouted cables, is very widely used in mining applications. Cables can be installed effectively in very narrow tunnels, they are inexpensive and have a very high load bearing capacity. This system is inexpensive. If properly installed, it provides competent and durable reinforcement. It can be installed to any length in narrow areas. The system gives very high bolt loads in various rock conditions, as well as high corrosion resistance in permanent installations. Tensioning of the cable bolt is possible only if a special installation procedure is adopted. The use of standard cement in the grout requires several days curing before the cable can be loaded. The system is gaining increasing use in mining applications. This system is used extensively in mining and civil engineering applications to hold slabby ground between rock bolts or to prevent slabs from loosening. Straps are easy to install with rock bolts. They are very effective in stratified, slabby ground. Straps cannot be used to control ravelling in loose, blocky ground if the block size is small. Steel straps are used to give roof control in ground where rockbolts or dowels alone cannot hold intermediate and relatively thin slabs of rock. The strap is formed to follow the rock surface and held with regular rock reinforcement or specially installed pins. Straps should always be installed across weakness planes. 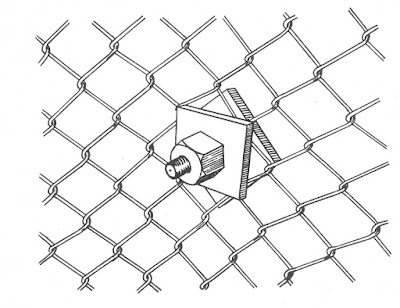 Wire mesh is used to support small pieces of loose rock and broken rock from falling. Two types of wire mesh currently used in underground operations are chainlink mesh and weld mesh. Mesh is very economical and quickly installed. It is easy to attach to roof reinforcement with extra faceplates and nuts. It is easily repaired. Mesh cannot carry excessive load of broken rock without failure. It is easily damaged by flyrock from nearby blasts. Mesh is useful for supporting small pieces of broken rock. Weldmesh is used traditionally as reinforcement for shotcrete, but is rapidly being replaced by steel fibre reinforced shotcrete. 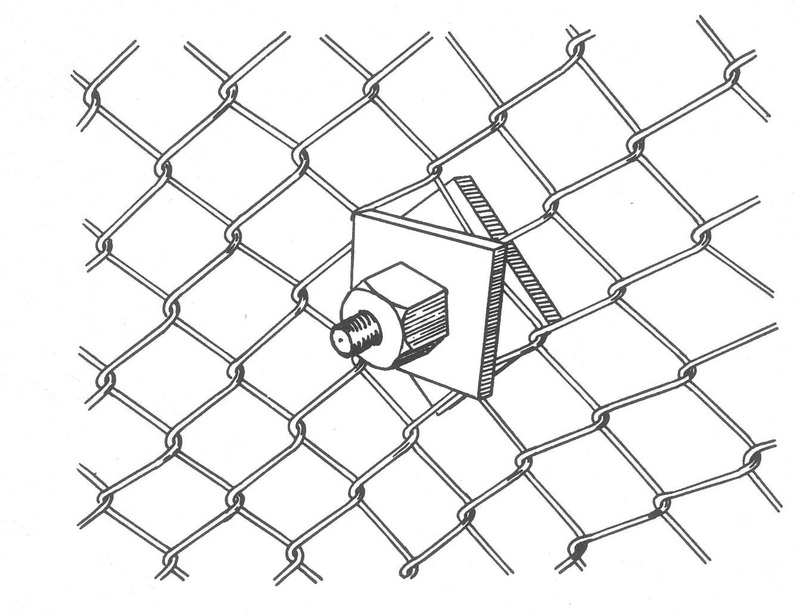 Mesh, like straps, is held in place with additional faceplates or washers and nuts on rockbolts or using separate pins. Pneumatically applied mortar and concrete have been used increasingly in the support of underground excavations both in civil and mining applications. Two basic types of shotcrete (dry-mix and wet-mix) can be used. Flexibility of equipment, batching and availability often result in the use of the dry-mix process in mining. This system is very adaptable to the tunneling environment. New technology has made mix design easier. Final product is highly dependent on the operators and especially on the nozzleman. The system has rapid support potential for loosened rock and changing stress conditions. It is as durable as concrete in most applications for roadways or as roof support. It is not recommended for drawpoints. 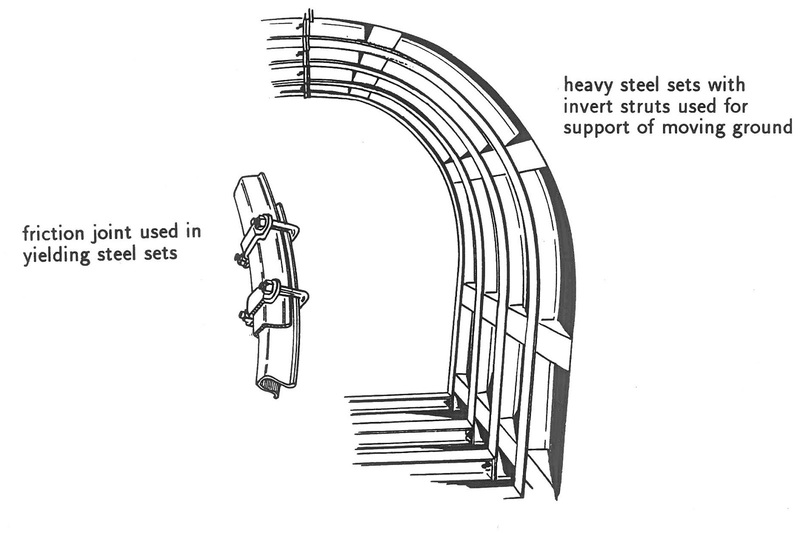 This system developed from the earliest use of timber supports underground, steel arches are now manufactured as rigid or yielding supports. They are employed for long term, permanent rock mass support especially in critical areas of roadways and intersections. Highly effective under heavy strata loading conditions. Continues to provide support after substantial deformation has occurred. Steel arches are time consuming to install properly. Unless well blocked, sets are ineffective. Prone to twisting under eccentric loading. Rock mass must undergo deformation before arch starts to take load, i.e. a ‘passive ’ support.